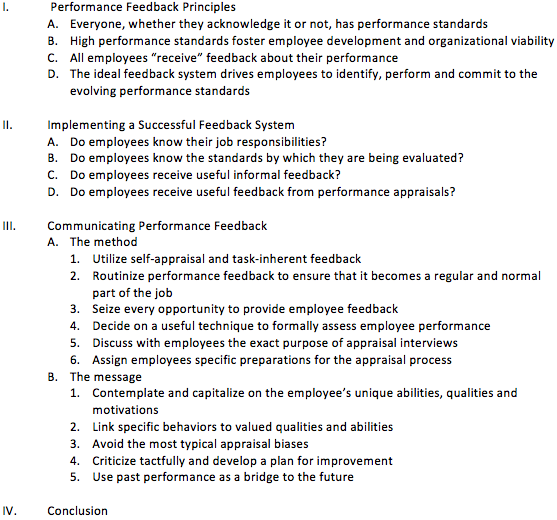 An effective feedback system helps employees learn, develop and improve. It also helps the organization align people with goals and optimize performance. However, many employees express low levels of satisfaction with the feedback system in their organization. An effective manager realizes that the method is as important as the message. Therefore, the manager needs to consider such things as deciding on a useful evaluation tool (rating scales, ranking methods, critical incidents) to achieve the purpose, using feedback from the task itself, not from the supervisor (“task-inherent” feedback), and assigning employees specific preparations for the appraisal process. The purpose of this case is to learn how to effectively conduct an appraisal interview from the interviewer’s and interviewee’s perspective. You are coaching a manager and employee on how to improve the appraisal interview process. You observe the following interview. Manager: Welcome Pat. I’m sorry we’ve delayed this meeting so many times. It has been tough coordinating our schedules. Employee: That’s OK, I’ve been rather anxious about this. You know this is my first appraisal since I started a year ago. Manager: I’ve tried to keep you informed along the way. Employee: But you’ve been very busy. Manager: We all are. But dealing with pressure is part of the business. Manager: Maybe we should begin. I want to start by reviewing your job responsibilities, then I want to go into the areas of strength and conclude with areas of improvement. If you have any questions along the way, just fire away. Manager: As you know, a year ago we established the position of communications coordinator. So we are still defining the precise responsibilities of the job. We primarily envisioned the job involving four areas: 1) editing the employee newsletter, 2) supervising the bulletin boards, 3) advising management on communication strategies, and 4) producing the in-house video magazine. Employee: Between a staff of three employees and me, we are trying to cover those areas. I think we have formed a pretty strong team over the course of the year. Manager: That’s true, but I have to look at the department’s productivity in terms of organizational goals. Employee: My staff and I understand that. Manager: In terms of strengths, I want to compliment you on coordinating the various communication activities around the organization. Our idea about pulling all the communication tasks together in one department seems to have worked out. You’ve done a great job coordinating those efforts. As a result, we’ve eliminated unnecessary duplication of efforts and increased the productivity of our staff. Employee: We’ve been able to target our communication vehicles more precisely in order to serve the various audiences in the company. That was one of our first tasks. Manager: Well you did a good job in that area. You also have done a nice job revising the newsletter. It looks more professional than in the past. Readership is up and the employees that I’ve talked to have commented favorably. I think your work on this demonstrates a flair of creativity that should be useful in other tasks. Employee: I made the newsletter our first priority because I knew it was an important piece in our communication program. Manager: There a couple of areas I’d like to see improve over the next year. First, I’ve been disappointed in the quarterly video magazine. What are your goals? Employee: To be honest with you, I haven’t really focused on it. We have been consumed with getting the newsletter on track. Manager: As a supervisor you’ve got to be able to direct several projects simultaneously. Frankly, I’m embarrassed by the quality–fortunately very few employees watch it. How do you see the video magazine improving productivity around here? Employee: I have one employee who has sole responsibility for the video magazine. I’ll have to get him going on it. Manager: Look, what I’m talking about is the strategic purpose. One of the key points of our quality program is improving communication by reducing the lag time in the feedback cycle. What I want to know is how does this activity help us do that? Employee: When we set our department goals next week, I’ll be sure to get on this guy, so that we can answer those questions. Manager: But strategic issues should be your concern–it’s hard for this guy to produce a quality product if he doesn’t know what the goals are. Employee: I’ll sit down and talk to him next week. You said we did a good job on the newsletter, right? Employee: Then give us some time and we’ll do a good job on the video. I promise you that. Manager: OK, let me just briefly mention my other concern. I’m concerned that you haven’t developed a plan for how your department fits into the broader organizational goals based on our quality initiative. Employee: But you said we put together a quality newsletter. Manager: True, but what I’m talking about is a more strategic focus, rather than one on departmental activities. I want to know how all the communication activities in the business are working together to meet our strategic objectives. That was the main rationale for creating this department. Employee: By sitting in on the strategic planning sessions, I know what our strategic vision is. Manager: But I don’t think you know how to think strategically. I’m talking about the “big picture.” I want to know how the department is LINKED TO the organization’s goals. I don’t see it. I don’t hear you talking about it in this discussion. I mean, even though the newsletter has “improved,” it is important to ask questions about how it fits into the overall strategic mission of the company. For example, what is the rationale behind the article selection? How do the articles relate to corporate objectives? These are the kinds of issues I want you to grapple with. Employee: How am I supposed to think strategically when I’ve got to put out a newsletter every two weeks, a video magazine every quarter, sit in on countless meetings, and advise speaker’s on their presentations? Manager: You have a staff. Employee: You don’t think that my team works well together? Manager: Of course, but that’s not the point. Employee: The point is my team needs more time to solve some of these problems. After all, we’ve only been together for a year. You don’t expect a losing football team to win the Super Bowl after a year under a new head coach. Manager: You’ve got a point, but I’m just trying to provide you some guidance. Employee: We appreciate that, but you have to admit we have put together a pretty good team. Employee: Give us a little more time and we will iron out all these difficulties. Manager: Agreed, but at least you know my concerns. And as I’ve mentioned, there are the strengths of the newsletter. Manager: I’d agree with that assessment as long as you understand the concerns that I’ve addressed. Employee: I do and I’m glad we had a chance to chat about my team. I’ll be sure to tell them how well they are doing. Manager: I just need you to sign and date this form to document that this meeting took place. Based on your observations, address the following and provide a rationale for all of your responses. Discuss the motivations of 1) the employee and 2) the manager. Discuss how well the manager taps into the employee’s motivations and vice-versa. Describe what you think will happen to the employee’s performance over the next year. Evaluate the effectiveness of the interview (use a “0”–“10” rating system). Suggest what the manager could do to improve the effectiveness of the interview as well as what the employee could do. Discuss how you are going to provide feedback to the manager and employee about this process. Which suggestion is violated most frequently? Why? If you were to add a suggestion to the video, what would it be? Why? How effective would this video be as a training tool? Why? What impressed you the most about this trainer’s advice? Where do you the think the trainer misses the mark? Is it consistent with the model discussed in the chapter? Would you hire this trainer to help you and/or your organization? Why? Why not? What is an example of the most effective pat-on-the-back you have received? Least effective? How were the two situations different? What is an example of the most effective corrective feedback you have received? Least effective? How were the two situations different? List three common excuses that managers give for not providing effective performance feedback. How would you respond to each excuse?